Dispose of a Sixth House base recently discovered near Gnaar Mok. Receive orders from Caius in Balmora to wipe out a Sixth House base in Gnaar Mok. Visit Raesa Pullia in Buckmoth Legion Fort to receive a report of the scouting party. Travel to Gnaar Mok and talk to the locals to find the location of the Sixth House base. Enter the Ilunibi caverns and fight your way to the shrine. Fight and slay Dagoth Gares. Once you have received copies of the lost prophecies from Nibani Maesa, return to Caius for your next assignment. He will warn you that the next assignment is very tough and advises you to make sure you're ready for it. Apparently, a Legion patrol stumbled across a Sixth House base near Gnaar Mok. Your orders are to find the base and kill the priest Dagoth Gares. Since Caius doesn't know the exact location of the base, you are to report to Raesa Pullia in Buckmoth Legion Fort. Buckmoth Legion Fort is just south of Ald'ruhn; the quickest way is by Silt Strider or Guild Guide. Raesa is just inside the main fort interior entrance. She gives you the report on the Sixth House base they discovered. Apparently, out of the original scouting party, only one person returned. He died shortly thereafter from the dreaded Corprus disease, but first mentioned a cavern on the coast named Ilunibi. Though Raesa is not familiar with it, she suggests asking the locals in Gnaar Mok about it. If you haven't been to Gnaar Mok yet, it's on the west coast of the island, southwest of Ald'ruhn. Raesa gives you directions to walk there, but the fastest method is to take the Ald'ruhn Silt Strider to Khuul, then take the local boat to Gnaar Mok. Once you get to Gnaar Mok, talk to just about anyone to find out information on the Ilunibi cavern (you will need to raise their disposition to 50 or higher to get the information). You find out that the caverns are located on the north end of the island, on Khartag Point. You should have Khartag Point marked on your map when you ask about it, just a little northwest of the village. You should find the caverns named as Ilunibi, Carcass of the Saint. Just inside the entrance to Ilunibi you'll find a very nice little waterfall. It gets much worse just farther in, however. Most of the monsters are random, but depend on your level: lower-level characters are most likely to encounter Skeletons, Ash Slaves, Ash Zombies and Scamps, higher-level characters more likely to have a chance of seeing Bonewalkers, Ash Ghouls, Ascended Sleepers, Atronachs and Golden Saints. There's also a fair number of Dreamers around. Once you get into the final section of the caverns, Soul's Rattle, you should encounter Dagoth Gares, a unique Ash Ghoul. He will initiate conversation with you and you should try and get as much information as you can before you exit: he can tell you some pretty interesting things about the history of Nerevar and Dagoth Ur, at least as seen from Dagoth's insane corrupted perspective. Once you exit the conversation he will immediately attack you. Gares is tough, casts spells, and hits pretty hard, but doesn't take too many big hits before he goes down. When he dies, however, he curses you with Corprus disease. After killing Gares, don't forget to loot the bell chamber nearby as it has some excellent loot (including the Fists of Randagulf). At this point in the Main Quest you'll start seeing several barely dressed Dunmer standing still on the roads. They call themselves Dreamers and are people who have fallen under the influence of Dagoth Ur's growing powers. They're the same Dreamers that you may have already been seeing in other Sixth House caves and they will attack on sight. 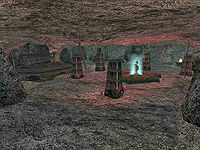 Once you've finished in the caverns, head back to Caius in Balmora (walk to Caldera, east of Gnaar Mok, and use a Guild Guide, or walk a little farther to Balmora southeast of Gnaar Mok - or simply cast Almsivi Intervention from the cave.) Upon your return, you will be promoted to Traveler. Caius is concerned that you have corprus, but has been gathering some information of his own and has found someone who is doing research into Corprus Disease with a view to finding a cure: the Telvanni wizard, Divayth Fyr. He suggests you visit Fyr on the grounds that if he can't help you, nobody else can. You may not receive Corprus after killing Gares. This can be fixed with the console commands player->AddSpell "Corprus" and Journal A2_2_6thHouse 50. When Caius asks you about your orders at the beginning of this quest (after you return from Urshilaku), keep selecting the answer: "I'm willing, but cautious" over and over again. He will keep giving you 400 gold, if your level is under 6. 1 Before I take my next mission, the Spymaster wants me to improve my skills. He suggests I take a few guild jobs, cash in the loot, and upgrade my equipment. He gave me 400 gold to spend. When I think I'm ready, I'll go back to him, and he'll give me my next mission. 2 The Spymaster suggests I do some more freelance work, and invest all I earn in training and equipment. When I think I'm ready, I'll go back to him, and he'll give me my next mission. 5 The Spymaster has sent me to find a Sixth House base near Gnaar Mok. There I must kill a Sixth House priest named Dagoth Gares, and bring the Spymaster a full report on the Sixth House base. But first I need to speak to Raesa Pullia, the Champion of Fort Buckmoth. She'll tell me about the patrol that found the base, and how to find it. 7 The Spymaster says a patrol found a Sixth House base in a cave the locals call Ilunibi. However, the one trooper who escaped to report died of corprus disease. Before he died, the trooper encountered monsters, cultists, and a powerful Sixth House priest called Dagoth Gares. The Spymaster says to go talk to Raesa Pullia, Champion of Fort Buckmoth. She'll give me the details. 10 I spoke with Raesa Pullia. The trooper who escaped died mad and disfigured with corprus. The cavern with the Sixth House base -- Ilunibi -- is not on the maps. I'll ask in Gnaar Mok about Ilunibi. The patrol fought cultists, disfigured man-beasts, and a half-man creature named Dagoth Gares. Dagoth Gares killed all the patrol, but sent one survivor out with messages about awakened sleepers and Lord Dagoth Ur. 20 A scout in Gnaar Mok told me about an old sea cave, called Ilunibi Caverns, up on the north end of the Gnaar Mok island, right on the coast. He said there was nothing but rats and slaughterfish, though smugglers and outlaws might use it for a hide-out. 40 The priest of Ilunibi Shrine tells me that Dagoth Ur bids me come to Red Mountain, where he would grant me counsel and power, if only I would pledge that friendship anew. He says the path to Red Mountain is long, and filled with danger, but there I will find wisdom, a firm friend, and all the power I need to set the world aright. So Dagoth Ur hopes to attract me to his service with promises of friendship and power. 42 Dagoth Gares says the Sixth House was only sleeping. Now Dagoth Ur and the Sixth House will free Morrowind of foreign rulers and divine pretenders. When the land is swept clean of 'false friends' and 'greedy thieves', the children of Veloth 'will build anew a garden of plenty in this blighted wasteland'. So the Sixth House means to drive out the Empire, overthrow the Temple, and restore the pre-Imperial Dunmer nation of Morrowind. 44 Dagoth Gares describes the Sleepers and Dreamers as new and weak worshippers. But the Children of His Flesh -- I think he means the corprus beasts -- are 'deep in the heart of his mysteries'. He also says that he and the servants of Ilunibi we are the least of Dagoth Ur's servants, and that servants called 'Ash Poets', 'Ascended Sleepers', and 'Ash Vampires' are more powerful and more blessed by Lord Dagoth. 46 Dagoth Gares says Lord Dagoth would far rather have me as a friend than as an enemy. But until I submit to Lord Dagoth, Sixth House servants will treat me as an enemy. If I want to be a friend of the Sixth House, first I must go to Lord Dagoth in his citadel on Red Mountain, and make my submission. 48 Dagoth Gares says Ilunibi shrine is only a small, quiet retreat where Sixth House servants share the sacraments of flesh and blood, and dream the dreams of their Lord. He says other lesser shrines are hidden throughout the land, but the greatest shrines of Sixth House servants lie beneath Red Mountain, in the citadels of our Lord and his close kin. 49 Dagoth Gares addressed me as if I were Lord Nerevar, giving me Dagoth Ur's words. Dagoth Ur says Nerevar and he were friends and brothers, but that Nerevar struck Dagoth Ur down beneath Red Mountain while Dagoth Ur protected a treasure Nerevar had sworn Dagoth Ur to protect. Yet Dagoth Ur offers to forgive me and raise me high in his service. So Dagoth Ur thinks I'm Lord Nerevar. I wonder about their history together. 50 Finishes quest I have killed Dagoth Gares, as the Spymaster ordered. But with his dying breath, Dagoth Gares pronounced a curse on me, and now I have the corprus disease. He said I would come to Dagoth Ur ' in his flesh, and of his flesh'. I don't feel any different, but the marks of the disease are plain on my face. I'll have to return and report to the Spymaster on the Sixth House base, and hope he knows of some way to cure this disease. This page was last modified on 24 February 2019, at 02:52.